Stuffed up nose? Try something spicy for dinner! Even though it was unplanned, during the next few days, it may seem like we are having dinner around the world with the titles of the recipes this week! 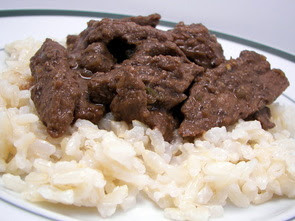 We start off on our excursion tonight with this dish of Indonesian Beef Curry with Coconut Rice. Since I was using brown basmati rice, I ended up starting it first since it can take 40-45 minutes to cook. Instead of using all water, half of it is replaced with coconut milk to give the rice a soothing cool flavor. While waiting for the rice, I started working on the curry by browning thin strips of top round in a bit of canola oil. Since there is a fair amount of beef, you want to do this part in two steps - if you don't, the beef will expel too much juice and begin to steam instead of properly searing. When the beef is done and removed, shallots, ginger, six garlic cloves and two whole serrano chiles are added to the skillet and allowed to soften. Using the whole chiles gave the dish quite a hit of heat - however, if you prefer just the flavor more than the heat, you can tame it by removing the seeds and ribs before adding them. Instead of using a prepared blend of curry spices, this recipe calls for adding the individual spices of coriander, salt, cumin, cloves, pepper, a few cardamom pods and a cinnamon stick. After these are given a quick toast in the same skillet, the beef is added back into the pan along with vegetable broth to help finish cooking. The broth also creates the thick sauce that coats the curry once finished - right before serving, a splash of fresh lime juice is added to brighten the flavors. While this spicy curry is somewhat soothed by serving it over the refreshing coconut rice... don't let its homely appearance fool you - it still packs a wallop and is a delicious way to clear your sinuses! *I've also gone ahead and brought the recipe section to the left up-to-date... you may need to hit refresh to see the new additions! 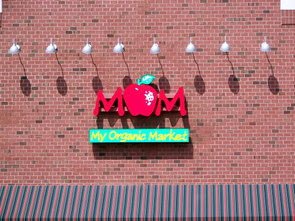 We ended up going to the grand opening of the new organic market that opened up yesterday - it is called My Organic Market. We have been going to a local Co-op called The Common Market since there are no Whole Food type stores within a reasonable driving distance for us and this market will be in direct competition with them. Unlike The Common Market though, MOMs is not a Co-op. We appreciated the very large re-usable shopping bag! We tried the chocolate bar today, but did not like it much at all... not being a big fan of milk chocolate, it was too sweet and had an almost sour taste to it! Oh well, I guess I can't complain as it was free! Once we got the grocery shopping done today and had lunch, I cracked open the King Arthur Flour Whole Grain Baking book to find a bread to bake since it had been a few weeks since I've used it. 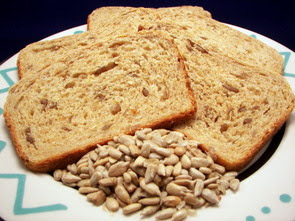 I found a bit more unusual whole grain bread to try with this recipe for a Toasted Sesame and Sunflower Loaf. You may notice a little different step in this recipe - the book recommends that with most whole grain yeast breads you mix the ingredients together just until combined and then to let the batter rest for awhile. Since whole grain flours tend to absorb liquid more slowly, this step allows the dough to thoroughly take on the liquid and will help prevent you from feeling that you need to add a lot more flour than you actually need when you work the dough. This also gives the yeast a head start - I found the dough much easier to knead and only had to add just a sprinkling of extra flour to keep the dough from sticking. Jeff's first comment when he smelled a slice was that it was almost like peanut butter! The bread is studded with a plentiful amount of sunflower and sesame seeds - the toasting of the sesame brought out a such a nutty aroma that I also thought was very reminiscent of peanut butter! I thought the use of toasted sesame oil in the dough was perfect - while it was baking, the nutty aroma that filled the kitchen was mouth-watering. With butter and milk added, this loaf is soft and tender - perfect for use in sandwiches or toasted and eaten plain for a snack as it has a very assertive flavor. If you want to keep the crust ultra-soft on this bread, be sure to give the outside a good brushing with melted butter as soon as it comes out from the oven. While we had a slice or two along with dinner tonight, my plan is to use this for a killer peanut butter sandwich for our lunches tomorrow! 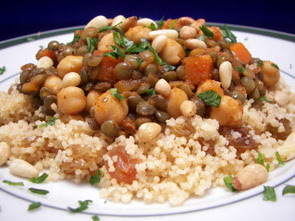 Tonight's dinner, Lentils with Chickpeas and Couscous, was only our second time having lentils and even though it was hard for Jeff to admit, he really liked them! The first time we had them, they were pureed into a soup, but in this recipe they are left whole and they were quite tasty. I used green French lentils so their texture would be a bit more firm as Jeff has an aversion to some foods that are too mushy. The cooked lentils are combined with a fiery sauce made from chipotle salsa, cilantro, tomato paste, cumin, onions, carrots and chickpeas. You can control the heat by using whichever salsa you like, but we wanted it spicy! To help soak up the chunky piquant sauce, we served the mixture over golden whole-wheat couscous that was prepared with a handful of juicy golden raisins - the raisins added a touch of sweetness against the smoky heat in the salsa. To give the dish one more punch of flavor, a scattering of lush toasted pine nuts top each serving. Since I was not able to do much baking in the past couple of weeks, I've really been itchin' to get a few things made that I've had on the top of my to-make lists. I'm always trying to keep the freezer stocked with different breads or muffins so we can have them on hand whenever the mood strikes - they always freeze well and do not take long to thaw at all. 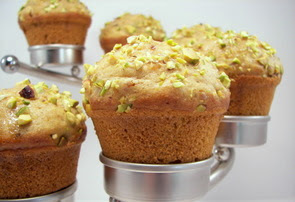 Today's Honey and Toasted Pistachio Muffins have lots of good-for-you ingredients packed inside with a nutty sweet topping. To boost the nutritional content, whole wheat pastry flour and flaxseed meal is used - I like using the pastry flour as it still gives you the nutritional benefit, but gives the muffin a lighter texture than using the heavier whole wheat flour. I like to keep whole flax seeds in the freezer and then use a small coffee grinder to process them whenever I need the meal. You could buy flaxseed meal, but it can go bad fairly quick and we find it just as easy to grind it ourself. Whole seeds tend to just get passed through your system, so you want to use the meal as your body is readily able to absorb the benefits. These muffins themselves are not too sweet with just a half a cup of brown sugar and are quite tender with the addition of buttermilk as the main liquid ingredient. Lightly spiced with nutmeg and allspice, plump golden raisins are also tossed into the batter to add another texture to the muffins. 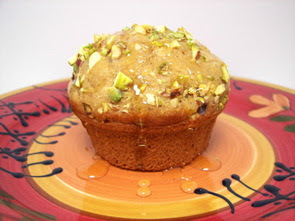 Topping these muffins are finely chopped pistachios for a little crunch on the crowns - while I normally toast nuts before using them, we opted not to since these will be exposed directly to the heat and will toast as they bake. There are just enough pistachios to cover the crowns, but not too much that they all fall off as you try to remove them from the pans or while eating them. A drizzle of sticky honey grants a final kiss of sweetness to add to the appeal of these moist muffins. Another weekend is quickly approaching and we will hopefully get caught up on a bunch of errands that have been nagging at us since we've been sick. 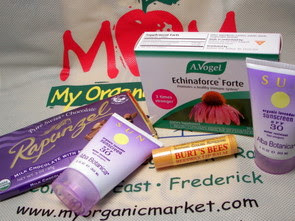 There's a new organic market opening up tomorrow that we are going to try and sneak into in the morning - I've never heard of it, but I guess they have a few stores closer to the DC area. More on this later if the store is any good! We go through quite a lot of eggs from all the baking we do and we also tend to use them in some form for breakfast. Sometimes we buy eggs from the farmer behind us with the Alpacas, but we usually end up buying the 5 dozen packs they sell at Costco. 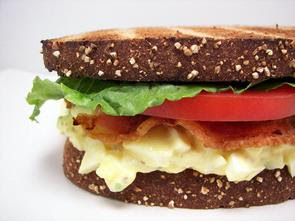 We'll have to pick up another pack this weekend as we almost used the last of them in tonight's dinner of Egg Salad BLTs. What I liked about this dish is that it came across much lighter with nice tang from the sour cream. Along with using light mayonnaise, two yolks from the eight eggs are removed to reduce the calories a bit - but since you're still using 6 yolks, it doesn't lose that rich mouth feel. A quarter teaspoon of lemon zest brought just enough lemon to taste, but not too much to distract from the other flavors. 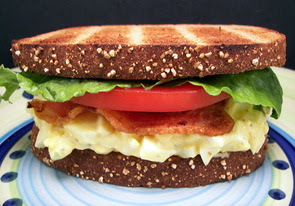 The base and top of the sandwich are toasted slices of hearty whole wheat bread and are filled with the egg salad, crisp salty bacon slices, juicy red tomatoes and a couple crisp lettuce leaves. We both really enjoyed this refreshing take on BLTs and since you could prepare most of the ingredients ahead of time and keep them separate, I think this would be great for a delicious lunch that would just take a couple minutes to toss together. Since getting over this sickness, I've really been seeking fresh, bright and filling foods to try and get us feeling back to normal. The two dishes we had tonight certainly filled those categories and ended up making a good dent in a small pile of lemons I had waiting to get used up on the counter. 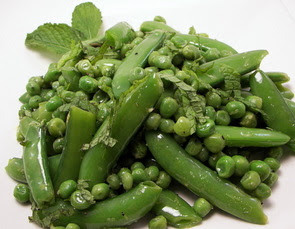 Just like last night, tonight's first dish, Sugar Snap and Green Peas with Lemon and Mint, makes use of those excellent spring vegetables that are starting to pop up around the markets. If green peas are not ready in your area yet, frozen would work just as well in this recipe - add an additional minute or so before you toss in the other peas. The vibrant green-colored vegetables are cooked just until crisp-tender and then lightly sautéed in a hefty pat of good ol' butter to lend a hint of richness. For a snappy finish, lemon zest and mint are tossed in for one more fresh and cool layer of flavor. Tonight's other dish, Pine Nut and Lemon Orzo, was probably intended to be a side, but we just increased the portion size a bit. 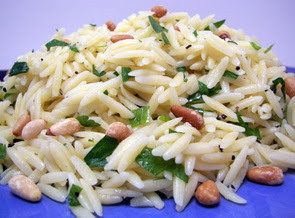 Fresh lemon dominates the rice-shaped pasta with a simple and clean profile from the use of the juice and zest. Extra-virgin olive oil gives the dressing some body with chopped parsley tossed in right before serving for a pop of color. A scattering of toasted pine nuts brought a delicate flavor with a mild buttery crunch against the tender pasta. When we were about halfway done, I did think that the dressing could have used a small shot of vinegar or something to give it a little more bite... Jeff also agreed when I mentioned this. If you want, you could add a grilled chicken breast for some protein, but this was pretty filling as is. I definitely think this dish would be a great picnic item and will have to mark it down to remember and make it in the summertime. 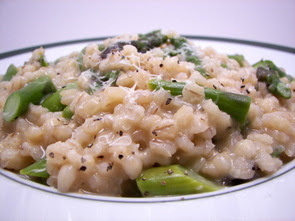 I had to rearrange the meals for this week since Jeff ended up catching the same bug I had last week... instead of the more spicy dinner I had planned, I decided to make a more mild Barley Risotto with Asparagus and Parmesan. However, this did mean I had to run to the market this morning to get some fresh asparagus! Instead of using arborio rice as in a classic risotto, this version uses the plump and chewy barley... but the way it is prepared is the same. Before you start adding the broth, make sure that you warm it up to a low simmer - this will help the grain more readily absorb the liquid as it will take slightly longer than rice to cook. I loved how the barley brought an earthy nuttiness while the white wine infuses a sharp undertone to the grain. Fresh spring asparagus is diagonally cut into pieces and is added with the last half cup of vegetable broth to keep them crisp-tender and not mushy. 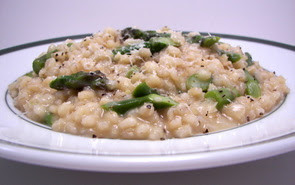 While not as creamy as a traditional risotto, Parmesan cheese added at the end does work that loved texture into the dish. This was very filling and I'm really looking forward to having this veggie dish as lunch tomorrow! 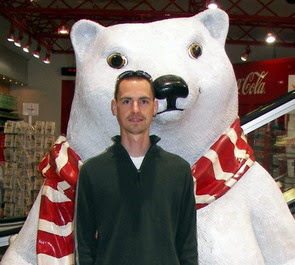 I spoke too soon... while I'm back to normal, Jeff seems to have caught the same bug I had. So, needless to say, tonight's dinner was leftovers for me and nothing much at all for Jeff. We doubt that he will be going into work tomorrow, but I have already gotten the Wednesday Treat Day baking done... so we are going to try and see if one of his co-workers would be able to stop by and bring it in for us tomorrow. While menu planning this past weekend, we talked about what would be good to share with them and Jeff asked if I had some sort of bread that would be a good morning snack in mind. I found a few recipes that looked good and ended up narrowing down the list to two. 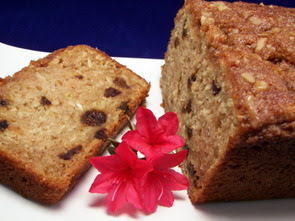 The first recipe, Oatmeal Breakfast Bread, has a spicy background from the addition of cinnamon, nutmeg and cloves. 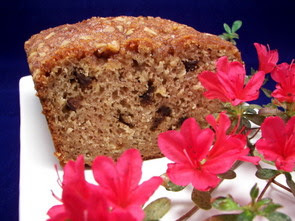 There is a good amount of applesauce added that makes the bread extremely moist with rolled oats keeping the loaf sturdy and lending a hearty texture to each slice. To pair with the spices, we added diced dried black mission figs for another layer - before you add the fruit to the batter, toss them with a bit of the flour mixture. The figs tend to clump together, so if you toss them with a small amount of the flour, it will help to keep them evenly dispersed in the baked loaf. To give the bread a special touch, brown sugar, crunchy walnuts and cinnamon are sprinkled on the batter to add a sweet and nutty topping. This second loaf, Walnut-Strawberry Quick Bread, will also be inducted into the extremely moist category and had quite a different flavor to it. Instead of applesauce like in the previous bread, the majority of the liquid comes from a good amount of smashed juicy red strawberries. For a bright background, a full tablespoon of lemon zest is added to the batter along with some toasted walnuts for crunch. With just a dash of nutmeg for spice, the main flavor here comes from the delicate strawberries which also gave the baked loaf a light pink hue. As with most quick breads and muffins, a light hand is best when mixing the wet ingredients into the dry - you want to stir by hand just until combined. You don't want large amounts of the flour to remain, but some lumpy bits are better than over mixing. Since both of these loafs are so moist, it is best to wait until they completely cool before you try and slice them into thick pieces. 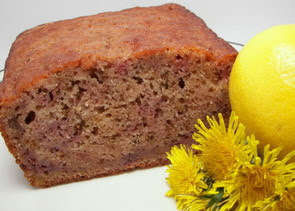 I will have to make this again and work some rhubarb into this bread... I would imagine that would be a killer combo! Hmm... peanut butter on pizza? 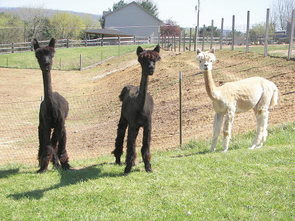 The Alpacas behind us have grown very hungry since spring has hit and they ran out of grass in their pen! Farmer Jon and family were out over the weekend and they now have lush green muchies on the ground again... and guess what? They are able to come right up to our fence now! Woo! 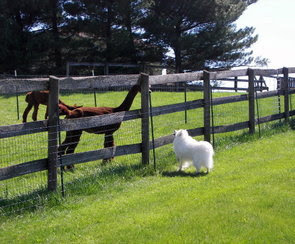 Max was a little unsure of these big guys sticking their heads over the fence to sniff him out, but he seems to be having fun watching them. Jeff thinks we should talk the neighbors into letting us open the fence into our backyard... I mean, who needs to cut the grass when you could just let these guys go nuts and have a buffet? Since we're getting back into the groove we wanted dinner tonight to be fun, different and of course, very enjoyable. 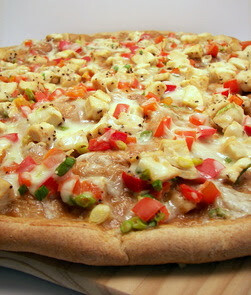 Since I had plenty of time last week to catch up on new magazines, I found this recipe for a Thai Chicken Pizza and I just couldn't wait any longer to give it a go. The original recipe calls for prepared pizza dough, but I just made my favorite whole wheat dough recipe that really comes together without much effort. While it also did call for a 20 ounce piece of dough, the recipe we used makes about 16 ounces and we left it at that - it was still enough to easily stretch out to the requested size. Once we stretched the dough out, it went into a very hot oven to give the crust a chance to crisp up as it really only needs to go back in to melt the cheese. A Thai peanut sauce takes the place of pizza sauce in the recipe - it is a combination of creamy natural peanut butter, water, soy sauce, rice vinegar, fresh ginger and a clove of garlic. 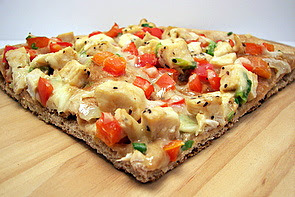 After the nutty crisp crust has been coated, a generous mixture of sautéed chunks of chicken breast, sweet red bell peppers and thin sliced green onions are scattered on top. A shower of shredded mozzarella cheese seals the deal and it slides back into the oven to finish cooking. I loved how the salty peanut sauce off-set the mild toppings and was able to stand out under the cheese and with a crispy thin crust, we were in pizza heaven! I think you could take one or two more steps to dress it up even further - I think I'll try the leftovers with a small handful of chopped peanuts and maybe some thin slices of Thai basil on top! Another short week as far as recipes go, but I've got quite the pile sitting next to me anxious to be made this week! I would have to say our favorites this week were the Creamy Cauliflower with Roasted Garlic and Chipotle, Turkey Mini Meat Loaves and the Mini Peanut Butter Cup Bars. If I was counting today's recipe though, I would most definitely be adding it to that list! Eating this Mississippi Mud Cake almost felt a little naughty, but the stats are not too bad for what you get. To give the chocolate a boost, natural cocoa powder is first mixed with boiling water to allow the flavor to develop - however, you want this mixture to fully cool down before you use it. Once the cake tests done, miniature marshmallows are scattered all over the surface of the hot cake and it goes back into the oven. The marshmallows will expand to fill in the spaces and begin to soften, but you're not really looking to get color on them. To fulfill the title, we now need to make a bit of mud to throw on top... and unlike something you would find outside, this is some sweet and enticing mud! This pitch black mixture of Dutch-process cocoa powder, evaporated milk, butter, confectioners' sugar and vanilla lights this cake on fire! 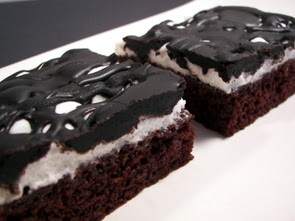 This is a cooked frosting that takes just minutes to prepare - when it is ready, it is thick, but it has just the right consistency to flow correctly. As soon as you take it off the stove, don't mess around - drizzle it right on the cake... as it cools, it will be too thick and start to set. 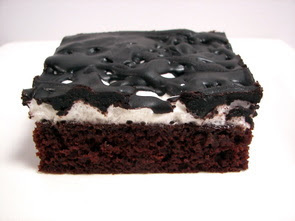 The texture in each bite is very intriguing -a chocolate-y moist cake topped with squishy marshmallows that is set off by a thick, rich and firm icing. We cut ours into 15 and the size was generous and quite satisfying - any bigger and it could almost be too much to finish! Jeff has fallen in love with this cake and I doubt any piece will leave the house to share... I think I'm lucky I got a piece to try this evening! We finally hit the jackpot with a wonderful sunny and warm weekend! It is already in the 70's and it is supposed to keep getting warmer... hurray! We're using this time to get ready to try our hand at a garden this year - while it won't be anything too fancy, we hope to get things going in the next couple of weeks and see what we can do! Jeff has been working from home as I was sick this past week and I felt bad that his co-workers were kind of expecting a Wednesday Treat Day that never came. 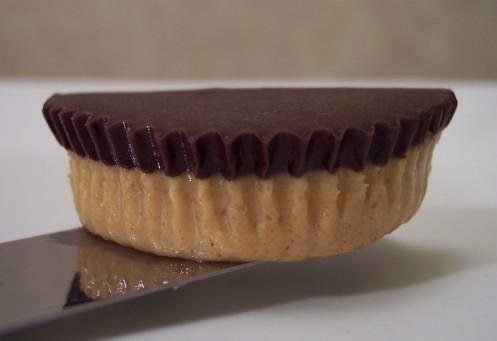 Since I was feeling better, I figured I could at least make a little something for him to take in yesterday and decided to make these Mini Peanut Butter Cup Bars. 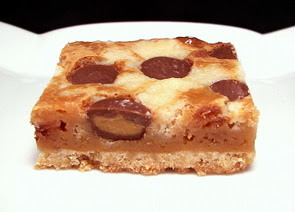 This is just your basic layered bar cookie - the base is slightly sweeter than most and is a mixture of flour, sugar, salt and of course a mess of softened butter. While most of it is pressed into a baking pan and given a quick pre-bake, we reserved a small portion of the mixture to be sprinkled on top later. As it cooks, a simple mixture of sweetened condensed milk and peanut butter chips are warmed together until they completely combine and then it is spread over the hot crust. The reserved crumb mixture is then tossed with some mini chocolate peanut butter cups and scattered on top. However, I took a bit too long to scatter this on and the crumbles started to melt into the warmed peanut butter layer and it looked a bit reminiscent of a leopard print... oops! While the baked bars are on the sweeter side, they are dense, cut cleanly and the peanut butter flavor shines through the rich base. 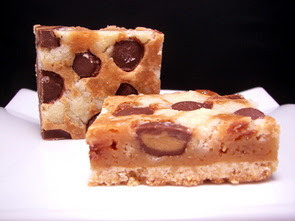 The mini peanut butter cups are an added bonus and are just the right size for a bar like this, but you could get away with using chopped chocolate chunks or chips if you want - the chocolate and peanut butter combo is always delicious! I went in for the ultrasound this morning and the doctor called back with the results much quicker than I thought they would! They said that even though there is nothing to worry about, they had set up an "emergency" referral for a stomach doctor early next week. Hmm... what a way to leave me hangin' for the weekend! Blah! I'm feeling better than I did yesterday, so it looks to me like it was just some stomach bug and it is finally letting go - hopefully we can start getting back to normal! Thank you for all of the well wishes - I've been quite anxious to get back in the kitchen and start whippin' up some goodies to talk about! While I probably should have done something plain like some rice or soup for dinner tonight, I decided to make a new recipe I found while I was catching up on magazines since I've not been able to do anything. I chose this recipe for Stovetop Sausage Mac and Cheese mainly because it did not have a lot of spices and looked to me like it would be on the bland side. For the sausage, I used a sun-dried tomato and mozzarella stuffed chicken sausage (not spicy at all though) that we lightly browned to start us off. To the browned sausage we added milk and a couple tablespoons of flour to thicken - once it came to a boil, we stirred in a selection of cheeses. We added sharp cheddar, Monterey Jack and while the recipe called for cream cheese, I used a few wedges of garlic and herb Laughing Cow cheese instead. We've been using them as a spread for Kashi's TLC crackers for years, but have begun adding them to creamy sauces for an extra silky feel. The only seasonings called for were a small amount of onion powder and garlic salt in the recipe - I kept this as is since I was trying to keep it fairly bland, but wanted some flavor. Once the cheese had a chance to fully melt into the sauce, we added cooked whole wheat macaroni and the dish was pretty much complete. It only took maybe 15-20 minutes to throw together and we both thought it was pretty good! The dish was creamy and cheesy without being too heavy. I would probably think about adding something else to help the dish come into its own though... either a bit more spice or even some buttered and toasted fresh breadcrumbs to be tossed on top for a special finish? So I like to think I am an active person and eat a pretty good diet... I don't get sick very often, but when I do it really knocks me out. I've not posted any updates these past couple of days because I haven't really been able to leave my bed - when I did, it was to go to the doctor to find out what was wrong and to get some IV fluids as I was pretty dehydrated. Apparently there is some wicked stomach bug going around and it thought I would be a good host. I have to go in for an ultrasound tomorrow, but it is not as bad today - I think my stomach is just sore from being sore... does that make sense? Anyway, since I was tired of lounging around in bed (really, it drives me crazy if I have to stay in one spot for so long) I thought I would make Jeff something different for lunch. 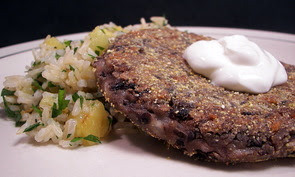 I went this recipe, Cuban Black Bean Patties with Pineapple Rice, that I was suppose to make earlier in the week for dinner. I should have probably picked something a little easier, but I wanted to get the pineapple used up before it went south. I only had a couple bites, but it was too much for my sensitive stomach - lesson learned... stick with much more bland foods! It is pretty simple to put together, but I'm just not feeling up to talking about it as I normally would - Jeff was definitely pleased with the results though and had some of the leftovers for dinner tonight. The one thing I did differently (this is reflected in the recipe) was to refrigerator the bean mixture before I formed them into patties so they would hold their shape well. If you have any questions about the recipe or the flavors, I'll be happy to answer them... but it may be a couple days until I am back to normal (assuming tomorrow's test goes well!) enough to really feel up to it. As we are trying to get back into the swing of things after getting back from vacation, I decided to do a couple dishes of comfort food, though a little updated, for dinner tonight. 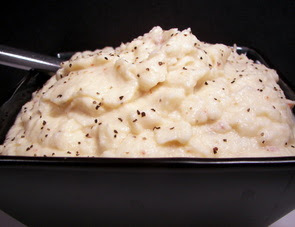 Instead of starting us off with a side like mashed potatoes, I decided to play around with something a little different and we ended up with this side of Creamy Cauliflower with Roasted Garlic and Chipotle. First, we began by roasting an entire bulb of garlic that was drizzled with olive oil and wrapped in foil. After letting the garlic cool a bit, the pulp was easily squeezed out of the individual cloves - we then mixed the softened pulp with cream cheese, milk and minced chipotle peppers. Once we cut up the entire head of cauliflower, we gently steamed the florets in a large pot until they were tender. The cauliflower is added in with the cream cheese and then I used an immersion blender to break down the cauliflower, turning the mixture very smooth. You could use a potato masher to combine the mixture to keep it a little chunky - but we were aiming for an extra creamy texture. Roasting the garlic mellows the flavor and lends a rich background with a hint of sweetness. 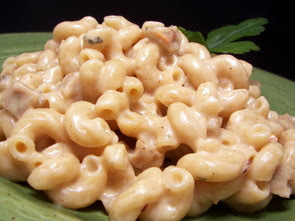 The cream cheese adds thickness and bring a luscious mouth-feel to the dish with the chipotle adding a mild smoky heat. It ended up being almost too thin though, so I may try adding the cooked cauliflower back into the hot, but dry, pot and letting some of the liquid evaporate off like you would do when you boil potatoes. 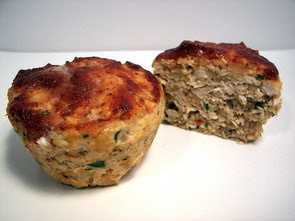 For the main portion of tonight's dinner, we took a lighter look at meatloaf with a recipe for Turkey Mini Meat Loaves. Since I grind my own turkey meat, I used a combo of dark and white meat to ensure the loaves would stay moist- but if you want, you could get away with using all white meat. Mixed with the ground meat are softened onions, garlic, parsley, Worcestershire sauce, ketchup and spices bound with an egg and a handful of breadcrumbs. For individual portions, the mixture is divided into muffin cups to bake - however, you could bake this as one larger loaf and slice it if you prefer. If you do that, it will take about 15 or 20 minutes longer to bake. Before the mini loaves are placed in the oven, we coated the naked tops in a mixture of ketchup, grainy mustard and a few dashes of Frank's Red Hot (cayenne pepper sauce). Since these will release some juices as they bake, be sure to place the muffin tin on a baking sheet to catch any drips so you don't get a mess in the bottom of your oven. With their tangy tops, these loaves were light, held their shape well and did stay quite moist from the onions and meat mixture. While they didn't blow our minds, they were very good, a little different and yet still gave that comforting feeling when you ate them. We only made 3 new recipes this week (one was a repeat! ), but that is pretty good considering we were gone for most of it! 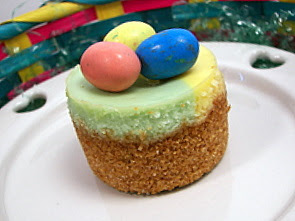 Sweets win out this time with our favorite recipes being the Easter Biscotti, Mini Easter Cheesecakes With A Chocolate Caramel Surprise and the Marbled Caramel Chocolate Bars. It is pretty miserable outside today - cold, rainy and windy... and unfortunately we were out in the elements for most of the morning trying to get the grocery shopping done! After we got back and had lunch, Jeff asked if I could make the dogs some biscuits as we were already low before we left... he said he gave them the last of their treats this morning! Instead of making something new, we decided to make the Crunchy BBQ Biscuits again - they seem to go crazy for these ones! I was planning on making something else for dinner, but after dealing with the groceries and making the biscuits I was not up for doing a lot of prep work for dinner. So I pushed off tonight's scheduled dinner to tomorrow and went with this recipe, Barbecue-Rubbed Pork Chops, that I had on tap for later in the week. The original recipe called for bone-in pork chops, but they didn't look good at the market... so we went with the boneless center-cut instead - I just ended up cooking them a little less. 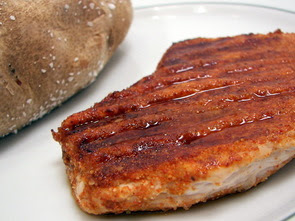 All this recipe does is combine a bunch of pantry spices with a touch of brown sugar - this is rubbed on the pork chops and then they are quickly grilled. Between the juices given off and the rub, it almost creates its own little sauce on the outside - it was slightly sweet, a little smoky and has just a little heat in the background. I opted for an easy side of fluffy baked russet potatoes that I rubbed with a bit of olive oil and coarse salt. Definitely filling, the only real effort in this dish was taking the time to wait for the potatoes to bake - a real no-fuss dinner on a dreary day! Before we left, we decided to have an early treat day this week - Jeff brought them into the office on Monday instead of Wednesday since we were going to be out of town. I briefly mentioned these, but these Marbled Caramel Chocolate Bars deserve a post of their own! 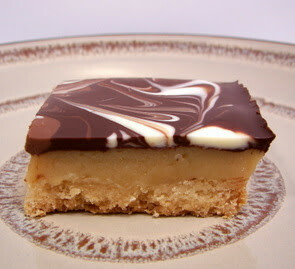 After doing some research, I've found that these can also be called Caramel Shortbread or Millionaire's Slice - whatever you want to call them, they are certainly enticing and very decadent. The bottom layer is simply flour, sugar, a dash of salt and soft butter that is given some love with your fingers until crumbly - all you need to do is press it into a tin and it bakes into a thick and buttery shortbread crust. While waiting for the crust to cool, you throw together a caramel - however, this one is one not to be afraid of and is fairly no-fail. A bit of butter, sweet muscovado sugar and sweetened condensed milk (did I mention this was rich?) are brought to a boil and then left to simmer until the milk thickens and turns a light caramel color. The most important step with this process is to keep the mixture moving - you want to constantly stir, otherwise the bottom will begin to scorch and give this an off flavor. Depending on how high your simmer is, this could take anywhere from 5-15 minutes - you will definitely be able to see when it is done as it gets pretty thick. Once this fantastic mixture is poured over the crust, it needs time to set - you can rush this by placing it in the refrigerator, but we just left ours on the counter and it was good to go in about 30 minutes. 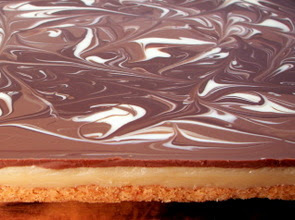 To push this over the top, alternate lines of bittersweet chocolate and milk chocolate are poured on the caramel layer. Dollops of white chocolate are scattered and with the use of a thick skewer, we gently swirled all the chocolate together. Don't do too much as you don't want to muddle the colors - you want to do it just enough so every piece will have a bit of each kind of chocolate on top. We cut ours into 30 pieces, but you could even cut them a little smaller and still be completely satisfied. The solid buttery base was a perfect way to show off the luscious caramel layer (though, it was almost more like dulce de leche to me with using the sweetened condensed milk). The trio of chocolates on top make for wonderful eye candy and finish this treat with a final mouthwatering layer of sweetness. Well, despite our efforts, we were not able to post any updates while we were traveling! Our laptop conked out on us and decided not to cooperate! Late Monday night we flew out to start a quick vacation to Las Vegas! We decided to give jetBlue a try for the first time... we will definitely have to fly with them again! 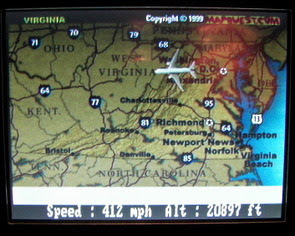 I loved the fact we could listen to satellite radio or watch DirecTV - especially when it was a 5 1/2 hour flight to get there! It was fun being able to see how fast we were going and where we we located at any given time as well - here's a snap... planes are not known for good lighting, so forgive the picture! 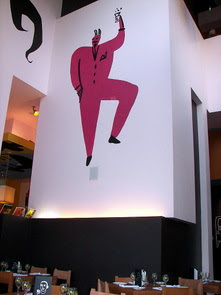 While there were a few "fancy" restaurants that looked exceptionally good, we decided to keep it more low-key this trip and check out some of the others. We decided to not worry about taking pictures of the food and just enjoy it instead - so I apologize for lack of photos! I think the most surprising hit was Border Grill which was started by the "Two Hot Tamales" Mary Sue Milliken and Susan Feniger. It just had a fun feel to it - Jeff had one of the biggest pork chops we have seen with a dish of Smoked Pork Chop with Cholita Glaze over a generous portion of boniato mashed potatoes. I went with the Chicken Chilaquiles which was just as delicious - the only downside to this place was that we felt a little ignored by the staff... but they were pretty busy. They did keep the theme interesting on the inside! Some other highlights were Wolfgang Punks Bar and Grill at the MGM - we ordered the Tomato, Burata Mozzarella and Basil pizza and the Ricotta Gnocchi with Sweet Fennel Sausage Bolognese. We both had half of each - the Gnocchi won out though and was way too good to split... I would have loved to had just that alone! We stumbled upon Cento & Fanti Gourmet Market for lunch one day and it turned out to be much better than we could have planned on! 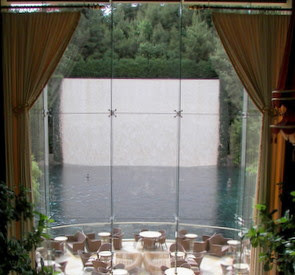 Nothing else was too remarkable - we did, of course, do a buffet... the lunch run at the Bellagio. While it was fairly good for a buffet, I'm not sure it is one I would run back too... the one item that I had more than my fare share of was their "blondie" from the dessert bar. I don't know what they did, but it was so good! 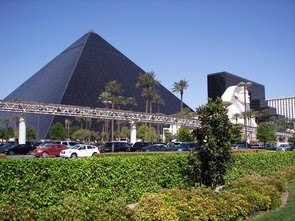 We walked way too much... we went from the Luxor area down past the Wynn on more than one occasion - we did have a car, but it was way too nice outside to justify using it! 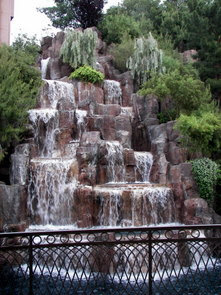 The Wynn was beautiful, the next time we go back I think we are going to have to stay there. These two are from the Wynn. 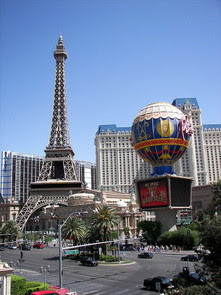 And of course Paris in Las Vegas - probably the closest we will ever get! 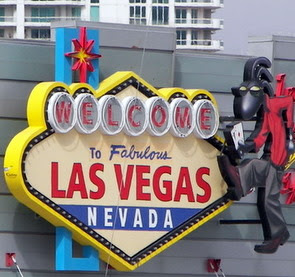 One day I wish to actually go! 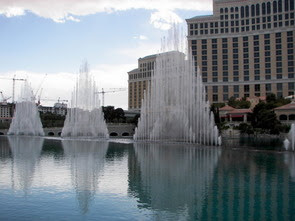 Finally, how could one not stop to watch the gorgeous fountains at the Bellagio - we lucked out, while it was very warm - we stopped at just the right time to watch the show as the sun was taken over by a large cloud while we watched! We took the red eye back and got into Washington around 6am... got the luggage, drove the hour back home and then went and picked up the dogs. We didn't sleep on the plane at all - we did take a nap this afternoon, but we are still pretty exhausted. Dinner tonight? Umm, no cooking as we need to grocery shop - while we could have ordered out, we just decided to keep it simple and make a couple fluffernutters (with "real" fluff of course...) with a side of chips! Oh and I didn't forget about the Marbled Chocolate Caramels Bars I mentioned on Monday... don't fret - I promise I will get them posted tomorrow after we get some sleep! I will also get to your e-mails and comments as soon as I can! This week will probably be a little slow around here as far as posting goes - we are leaving tonight and will be away from home until Friday. I'm not sure how much access we will have to the internet though, so who knows what to expect! This means we won't be around for the Wednesday Treat Day this week, but don't worry - I did take care of Jeff's co-worker's today! I'll let you in on some wicked Marbled Chocolate Caramels Bars when we get back! 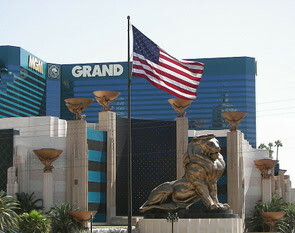 If you are wondering where we are going, be sure to check back for updates sometime this week. I didn't get a chance to post last night about the dinner we had, so I thought I should get that up before we left. Since I was quite busy baking in the kitchen, I didn't want to make something that would take too much time - I went ahead and decided to make this Pasta Carbonara Florentine. With bacon, pasta and cheese it was hard to think of this as a light dish - but using center-cut bacon, whole wheat pasta and tossing in some tender baby spinach made a difference in the end. Pasta Carbonara was one of the first dishes I tried to make a few years ago when I started to get serious about cooking - I was not all that successful though as I had little chunky pieces of scrambled eggs throughout. 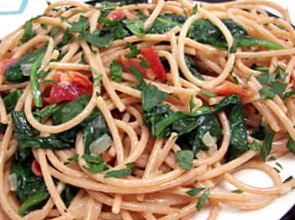 However, this recipe resulted in a smooth, creamy sauce that gave the pasta a wonderful sheen. 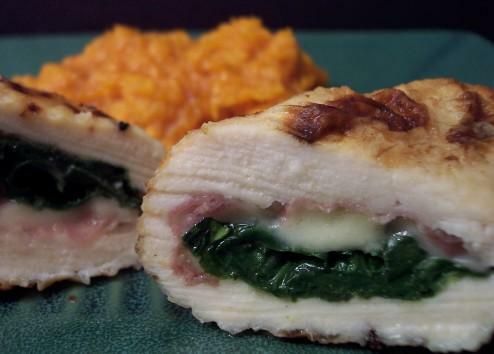 You wouldn't normally find spinach in this dish, but it added a nice pop of color and it helped to cut through the richness. Since you cook the onions in just a little of the bacon fat, you get that smoky background all through the dish without adding too many calories. At four servings, the portions are a little small - but with a serving of fresh vegetables or maybe even a couple quick drop biscuits like we did, it was a very satisfying dinner. Even though the weather is not cooperating, it is spring and today is Easter! That should mean it will begin to warm up soon and get out of this cold snap! Hopefully you dressed warm if you had to go outside to look for eggs! We made 9 new recipes this week - we had a few favorites and they were the Whole Wheat Pasta Salad with Walnuts and Feta Cheese, Lemon Meringue Pie Cupcakes, Black and White Angel Food Cake, and the Spinach-Feta Calzone Casserole. We did happen to make a couple Easter treats to share with the neighbors - one new and one repeat that we just had to make again from last year. 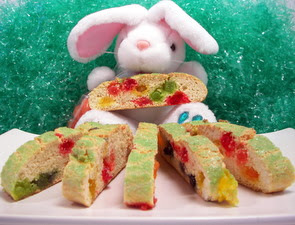 Jeff said there was no way we were letting the holiday go by without making this Easter Biscotti again. 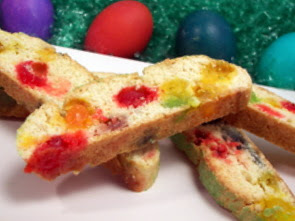 Yes, it is not very traditional for biscotti, but it is surprisingly good and it is a fun colorful treat! This year we used LifeSavers jelly beans which brought lots of different flavors... my favorite bite was when I got a duo mixture of pineapple and lemon! The only other thing we did different was to add some light green sanding sugar on top before they went into the oven for the first time. 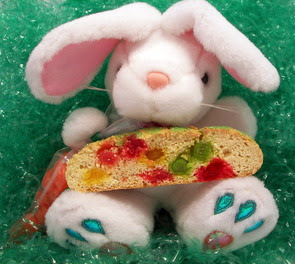 The bunny is feeling very generous today and would like to share with you too! 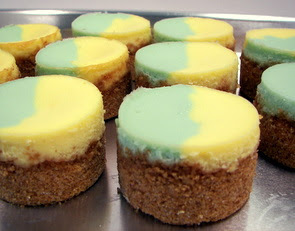 We also wanted to make some small individual cheesecakes - but these have a surprise inside! I started out by making a graham cracker base, made simply from cracker crumbs, sugar and melted butter, and pressed them into my mini cheesecake pan . I probably went a bit high up the sides, but I love crusts on cheesecake! Once we gave them a quick pre-bake, we set a small Rolo candy (it is a chocolate candy with a soft caramel inside) on top of each individual crust. I then quickly mixed up a basic vanilla cheesecake base and we decided to divide the batter and tint one a light blue and one a light yellow just to be a little more festive. Don't wander too far when these go in the oven - they only took around 15 minutes to bake; you want them to be set... but still a little jiggly in the center if you gently shake the pan. If you don't have a mini cheesecake pan, you can use a regular muffin tin - just line them with papers so they will be easy to pull out of the pan. We were going to do some colored coconut on top for a nest, but we wanted the two colors to show up on top - so we just placed a few malted milk candy eggs on top! 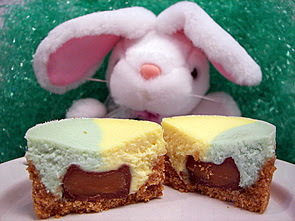 Perfect as individual sized treats, these cheesecakes were velvety smooth and creamy - the chocolate candy hidden inside kept it shape well and added a rich unique surprise. Fig, dates and walnuts... oh my! When I went pull out some chicken from the freezer this morning, I noticed that we did not have a good variety of snacks in there. I decided that I needed to make a quick bread this morning, so we could have slices waiting in the freezer when the mood strikes. I was never really a big fan of figs until a couple years ago - I'm not sure what changed, but I find them to be quite good now! I knew we had some dried black mission figs from Trader Joe's in the pantry, so I went to find a recipe would use some of them up. 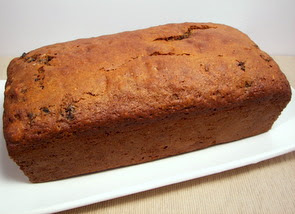 As I delved into the stacks of recipes, I pulled this Fig, Date, and Walnut Quick Bread recipe that has been in my to-try pile for a good long time. To bring the fruit back to life a bit, the dried figs and dates are soaked in a warm mixture of buttermilk, lemon zest, nutmeg and cloves. You want to bring the milk mixture up to almost the simmer stage, but you don't want it to boil - it will curdle and separate. If that does occur, I would still probably go ahead and use it - the mixture will just look a little odd! This is a fairly low-fat bread as you only need to add two tablespoons of oil - don't let that turn you off though, even with that minimal amount, the figs and dates keep the bread quite moist. Besides adding moisture, the figs and dates also add a gentle sweetness, so a half cup of brown sugar brought just the right amount of rich sweet flavor. The original recipe calls for chopped walnuts to be placed on top of the raw batter, but I was concerned that they would fall right off when you went to slice the baked bread. I decided to just toast the nuts first and then fold them into the batter. 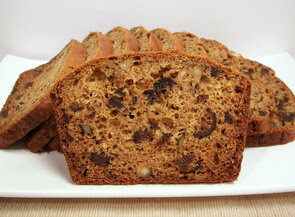 This dark bread has a slightly spicy edge to it from the nutmeg and cloves - before taking a bite, Jeff was certain that it was some kind of gingerbread from the aroma!